Clubs are for children aged over 5 and arrange activities according to age group, supervised by multilingual organisers. With outdoor games, sports tournaments, treasure hunts, handicraft workshops, sports contests and plenty more, each day will produce its own set of surprises, perfect for making new friends and enjoying activity-packed days! On Friday evenings during July and August, your children will be proudly staging the show they've been hard at work putting together during the week! You're in for a lovely surprise seeing the budding talents of your little ones on stage! There is an activity park especially for younger children supervised by their parents. Young children love camping holidays! Discovery of new activities, new friends, artistic talents, brand-new sports… so many reasons to join the Juniors Club! To make sure their holiday is a truly unforgettable one, teenagers also have their own club (open in July and August) where they can get together, chat and have fun with all sorts of activities to choose from! At the Yelloh! Village les Grands Pins, we don't make you do anything, we just make suggestions! This is how we do things with children aged 13 to 17. At the Yelloh! 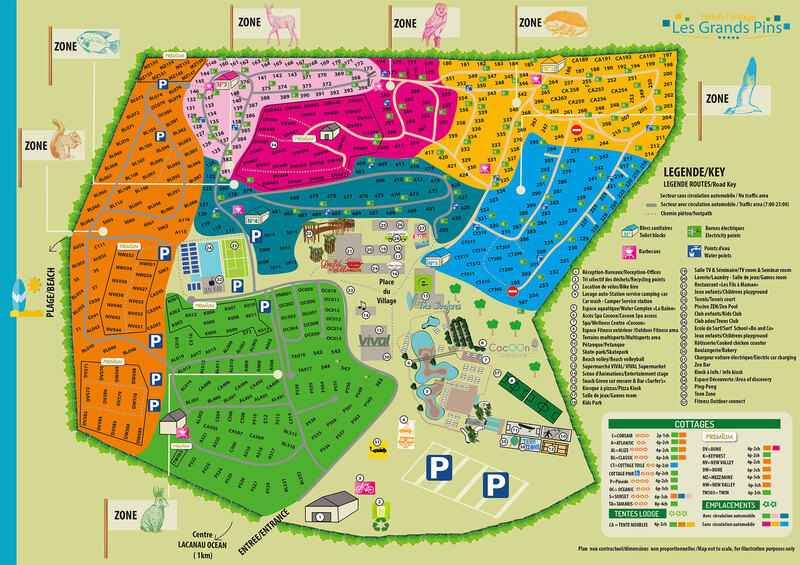 Village Les Grands Pins, everything's been arranged to make sure families have a great camping holiday! There's not a moment to lose! Come and enjoy a camping holiday with your family at Lacanau and enjoy some unforgettable times together! Enjoy the large playgrounds, the pirate ship (for children aged 2 to 12), the lighthouse-slide (for children aged 3 to 12) and the big bouncy castle (for children aged 3 to 12) as a family! You're in for a great time together! A fantastic two-master has dropped anchor at the Yelloh! Village Les Grands Pins! Kids are going to love it! At the campsite, your little ones will have an area that is especially for them: with parental supervision, they'll be able to play and learn new things in the 60 m² covered Kids' Park, with a maze, a waterslide, swings and foam waves! Kids' Club: ages 5/7 and 8/12: Sunday to Friday: 10am – 12pm / 3pm – 5pm, throughout the season. Teens' Club: ages 13/17: Sunday AM to Friday: 11am – 12pm / 5pm – 7pm, only in July-August.